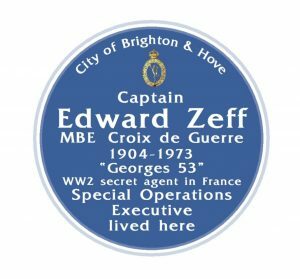 A blue plaque to Captain Edward Zeff MBE, Croix de Guerre, will be unveiled at Embassy Court this Thursday, 30th of March 2017 at 12 noon. We are very proud and privileged to honour this exceptional man and former Embassy Court resident. 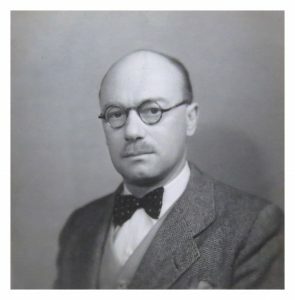 The son of a Brighton tailor, Edward Zeff trained as a signaller in World War Two and, as a fluent French speaker, volunteered for the French Section of the Special Operations Executive. He was sent to occupied France in 1942 where he worked under a variety of identities and code names including “Georges 53”. He worked for 11 months as a secret agent and radio operator, organising receptions and escapes of agents and transmitting an enormous volume of valuable intelligence to the SOE in London. He was betrayed in 1943. When the Gestapo unearthed the fact that he was Jewish his treatment was appalling. Despite beatings, torture, time in two concentration camps and twice being scheduled to be gassed, he gave away nothing of the organisation he worked for or the agents that he knew. His courage, sang-froid and his demeanour under extreme duress won the admiration of all those who met him. He was awarded the MBE by the British and the Croix de Guerre by the French. He was liberated from Mauthausen concentration camp in 1945 and arrived home to his wife Reine at Embassy Court. He later returned to his business in Paris where he died in 1973. We would like to thank the Mayor of Brighton, Pete West, as well as Roger Amerena and all at Brighton and Hove Commemorative Plaque Panel for making this event possible. And we would also like to thank historian Paul McCue, researcher Martyn Cox and everyone at the Secret World War Two Learning Network for their invaluable support and for making the stories of Brighton’s secret agents visible to the public for the first time. Edward Zeff in disguise as “Etienne Pierre Pascal” one of his personae in occupied France.